We were introduced to Joe Payne through the Duke Chapel suggested wedding photographer list. He came highly recommended from the wedding chapel coordinator and we are so happy with our decision to have Joe do our wedding photography. Not only was Joe a joy to be around on our wedding day, His photos completely captured our feelings and memories of the day in a fantastic way. Prior to our wedding Joe was very accessible for meetings and discussion of our plan for our wedding day. We even had a Skype meeting as we are not local to Raleigh. He offered suggestions on an approach to photos for Duke chapel’s very strict time schedule and were able to get all the photos we wanted at the chapel in the time we had. After our ceremony we visited Doris Duke Gardens for photos of our bridal party and just us. The photo session was split in a way that our bridal party was able to head back to freshen up before the reception while my husband and I had a private shoot with Joe. We didn’t know until it happened how important this time was to be alone and have fun taking photos with Joe without the rest of the bridal party. He was very easy to take direction from and captured the beauty of the garden and us in a very natural and comfortable way. He heard our requests prior to the wedding day and got all the photos we requested and blew us away with how they came out. 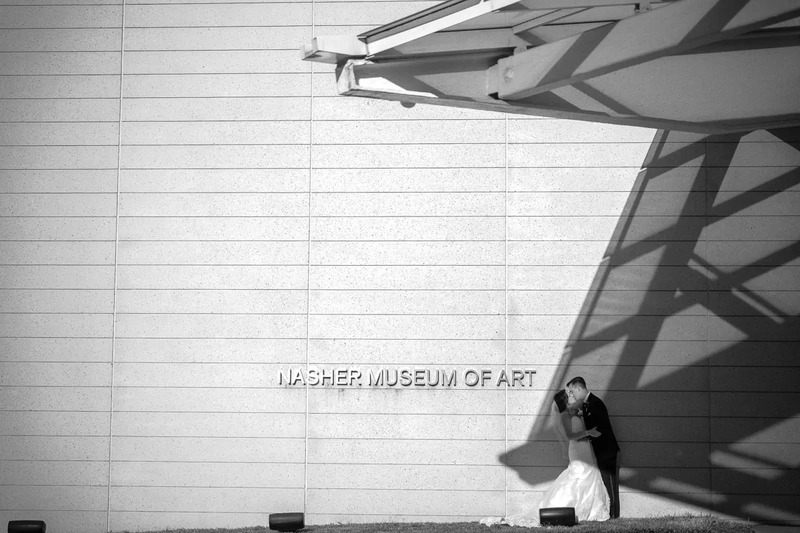 At our reception Joe found very interesting and beautiful ways to capture our guests enjoying the reception and highlighted the beauty and uniqueness of the Nasher in each photo. Joe blended in with our guests at the reception and captured many great shots. Joe has great vision and knows what shots will be amazing and they were all amazing. He frames photos beautifully in the architecture of each space and the light quality was amazing every time. We couldn’t have been happier with his work and talent. Joe also sent us our photos very quickly after our event and had a good balance of black and white and color photos. We would highly recommend Joe to any bride and groom for their wedding to get the best photos of your day and an extra enjoyable guest at your wedding!